When the master minds behind Chambers of Horror and Diesel Filling Station sit down for a beer, strange things happen. In the Spring of '09 after many beers and shots the Zombie Pub Crawl was born. 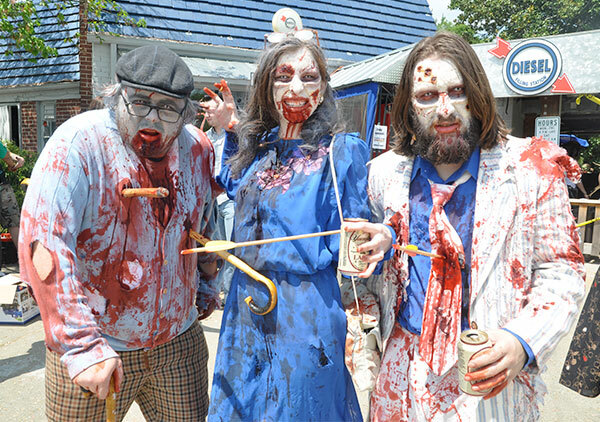 Conveniently located in the heart of the Virginia Highlands, the ZPC (Zombie Pub Crawl) strives to strike fear in the residents and customers strolling up and down N. Highland Ave. What would it look like if the undead walked the streets, how would the innocent bystanders respond? That was the question that arose, and the ZPC is the answer. Event producer MarksterCon.com was brought on board for the 4th edition of the Zombie Pub Crawl and since then the event has morphed into one of the biggest geek-themed pub crawls in Atlanta, attracting 700+ attendees and spectators annually ever since. Once customers have received their zombie make overs, the horde takes over local pubs and restaurants in the Virginia Highlands area. Spanning streets, patios and bars, they 'stumble' from location to location devouring adult beverages and scaring the living. Be here for the 10th ZPC on July 27th, 2019...it'll be one hell'uva bloody good time! !